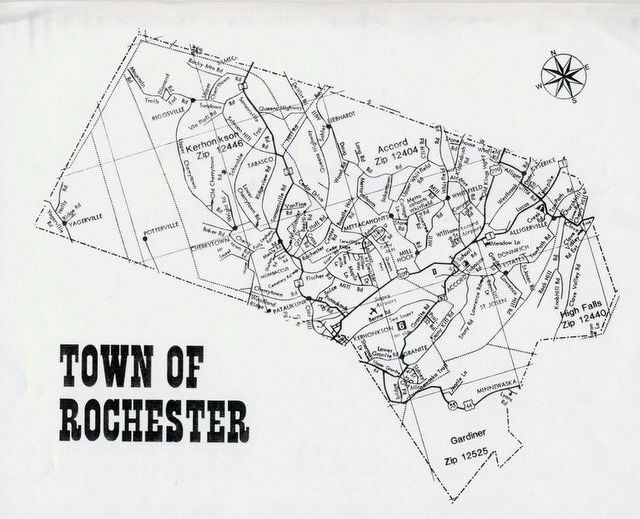 The town of Rochester town hall and community center are located in the hamlet of Accord, a half mile off Route 209. We are a scenic 15 minute drive west of New Paltz. Traveling South on NY Thruway (I87), exit at Kingston (Exit 19). Bear right after the toll booth and follow signs for 28 West and/or 209. After first light, go over the bridge and take exit (on right) to 209 South (towards Ellenville). Travel South on 209 for 15.5 miles. Turn left onto Main Street (across from small grocery store). Make second right onto Scenic Road. Proceed to Town Hall (50 Scenic Road). From NYC, take the Thruway (I87) North to New Paltz (Exit 18) . After exiting, turn left onto SR 299 West through New Paltz. Continue for 7.5 miles. Turn right at T-junction onto US-44 (RT 44-55). Proceed over the mountain for 10 miles to T-junction (Rt. 209). Turn right on Rt. 209. Proceed (through Kerhonkson ) for approximately 5 miles. Turn right onto Main Street (across from small grocery store). Make second right to Scenic Road. Proceed to Town Hall (50 Scenic Road).